Canadians are some of the most well-travelled people in the world. Even so, there are tried and true destinations that Canadians continue to favour. Statistics Canada keeps track of where we're travelling and, while there are small shifts in where we go occasionally, the top 10 destinations for Canadians hasn't changed much in the last few years. 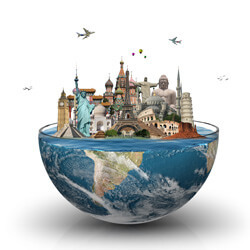 Where in the world will you travel to next? Your Canadian health insurance is almost certainly not valid outside of Canada. Your provincial or territorial health plan may cover nothing or only a very small portion of the costs of medical care abroad, and never up front. Foreign hospitals can be very expensive and may require immediate cash payment. You could face years of debt paying off the costs of treatment for an illness or accident you suffered abroad. The Government of Canada will not pay your medical bills. When you're away from home, even a small accident or sudden illness can become a big medical expense. No matter how short your trip, or how close to home you'll be, you should never travel without travel insurance coverage. Updated annually to reflect Statistics Canada's most current information available on the travel trends of Canadians.